Posted July 3, 2018 and filed under Health Awareness, Hyperbaric Oxygen Therapy, Stem Cell Therapy. Hyperbaric Oxygen Therapy (HBOT) is a powerful treatment used to aid in the healing of many conditions and illnesses. Individuals who undergo this unique form of therapy sit in a controlled environment, called a chamber, with higher levels of oxygen and increased atmospheric pressure. Together, the pressure and high oxygen concentration help to oxygenate the blood, which can facilitate cellular regeneration, healing of wounds, and decreases in inflammation levels. The therapy can treat burns and sores, concussions, sports injuries, and decompression syndrome, among other ailments. In fact, the benefits of HBOT span so far and wide that some individuals have even sought to bring the treatment into their own homes. This is done using soft HBOT chambers, which are different from the hard medical-grade chambers that are operated by professionals in treatment centers. Here, we walk you through the key differences between hard and soft chambers to help you make informed decisions about your treatment options. 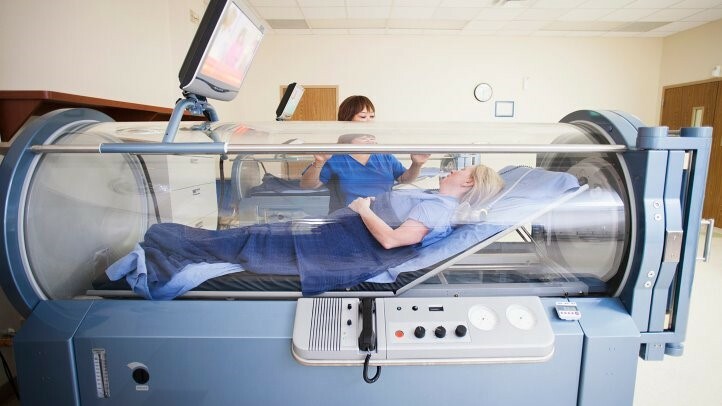 To understand the most crit ical differences among hard and soft chambers, it’s important to revisit the two key principles of HBOT: oxygen and pressure. Combining these two factors to facilitate an environment in which expedited healing can take place is what makes this form of therapy so effective. In hard chambers, the air features 100% medical-grade oxygen and is commonly pressurized to a maximum atmospheric absolute (ATA) of up to 3.0, or a depth of 66 feet. They are specifically built to achieve pressures for therapeutic purposes, and some can go to 6.0 ATA. The immense level of healing achieved through these systems is backed by thousands of clinical studies and has even been shown to aid in bone and tissue regrowth. Conditions that have shown benefit with HBOT in conjunction with stem cell therapy are Multiple Sclerosis, Traumatic Brain Injury, Post-Stroke, and Sports Injuries to name a few. This is because hard chamber HBOT can mobilize stem cells (CD34+ pluripotent cells) responsible for the regrowth of significantly wounded areas. Hard HBOT chambers can also kill harmful bacteria. Because these hard-sided chambers are found only in medical or therapy centers and controlled by trained professionals, the risks of breathing contaminated or polluted air are mitigated. In addition, hard chambers meet the American Society of Mechanical Engineers Pressure Vessels for Human Occupancy (ASME-PVHO-1) standard. However, because it is illegal to purchase medical-grade oxygen without a prescription, this form of therapy can only be received under the care of specialists. Unlike hard-side d chambers, soft-sided HBOT chambers are portable and can be purchased for home use. They typically feature a steel frame with a zipped inflatable chamber. 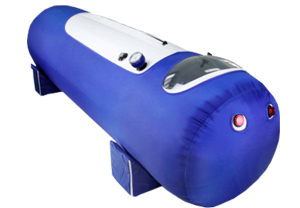 Oftentimes, they are used as a temporary treatment for divers and mountain climbers suffering from decompression syndrome and altitude sickness when they are already in route to receive HBOT in a hard chamber. On the surface, soft HBOT chambers might seem like a convenient alternative to receiving therapy at a treatment center. Yet, research shows that these solutions are ineffective for achieving the same level of benefits provided by hard chambers, and in fact, using them can put patients at risk. Let’s return to the two components needed for effective HBOT: oxygen and pressure. While the air in hard chambers is 100% medical-grade oxygen, soft chambers used at home feature regular ambient air, with just 21% oxygen. Plus, they can only be pressurized to 1.3 ATA, or a depth of roughly eight feet. This lower pressure level is simply not enough to facilitate healing. Used in conjunction with 100% oxygen (which again, can only be administered by medical professionals), it can be used as a temporary treatment for altitude sickness and decompression syndrome – but that is all the FDA approves soft-sided HBOT chambers for. Therefore, they serve little purpose in the home setting. In fact, it isn’t recommended for soft chambers to be used for any type of healing outside of treating the two conditions described above. Not only are the oxygen and pressure levels too low to achieve treatment, but the environment can promote the growth of undesirable aerobic bacteria. Soft chambers do not meet the ASME PVHO-1, have not been proven to promote healing through clinical research, and may even pose risks of breathing in polluted or contaminated air. Ultimately, soft chambers may provide medical benefits in very specific circumstances, but hard chambers are the only vessel for HBOT that can support all types of healing by oxygenating the blood and stimulating stem cells. When practiced under the care of trained professionals, hard chamber HBOT poses few minimal risks and can make a significant difference in improving an individual’s quality of life.